We go to great lengths to provide Japanese Beetle Control to protect our Urban Forest! One of the growing concerns with property owners in the Kansas City area over the past few years has been the risk of the Japanese Beetle, and the devastation it leaves behind. Especially with the adult Japanese Beetle, those pests threaten our Urban Forest. As certified arborists in the area, we have helped local Kansas Citians rid their property of these pests with the plant health services we provide. When you need Japanese Beetle Control, we are the Kansas City tree service you can trust! 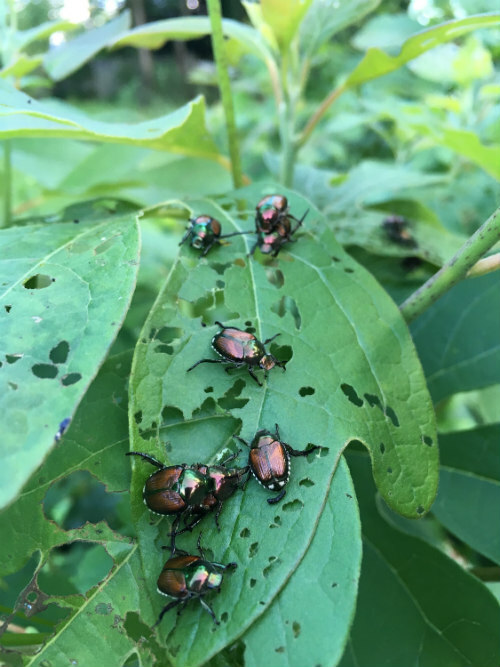 Though the Japanese Beetle was first reported in the US over 100 years ago, it’s been relatively recently that residents in the Kansas City area have been faced with the challenges of the bug as the Japanese Beetle infestation is on the rise in our area. Whether it’s your trees, shrubs or rose bed, this insect will eat it alive. What’s Eating My Tree Leaves? The Japanese Beetle is known for it’s method to chew the plant from outside-to-in which will eventually cut-off the food supply for your plant. It’s important to remove the Japanese Beetle as soon as you can because this type of insect attracts other insects to the food source. 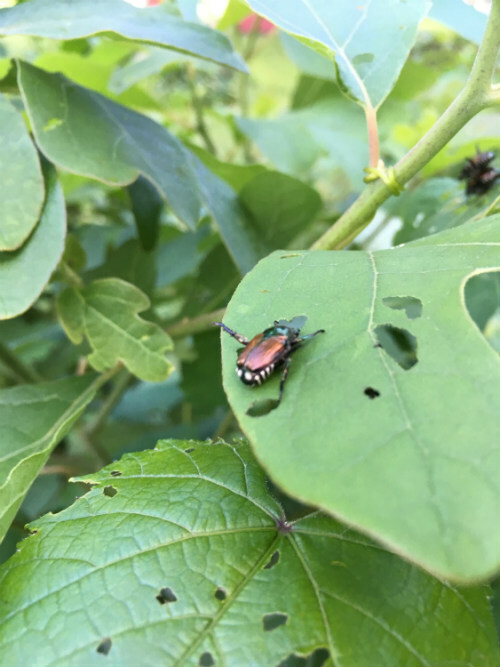 According to an expert’s opinion, “Japanese beetle adults are one of the most destructive insect pests,” and residents in the Kansas City area should especially be aware of the harmful effects this bug can leave behind. There’s been an unnatural spike in interest for “Japanese Beetle” within the past year, and we’ve seen this especially true in our local area. For some residents, it seems that there isn’t an answer for how to control the pest. Though, we can show you that there is a solution to help reduce the growing risk of damage from this pest. By taking action sooner rather than later, you will help to reduce the damage from this insect on your property. We will help you educate you more about the growing risk of Japanese Beetle in Kansas City and what methods are used to control the Japanese Beetle. Take a look at some of the facts about Japanese Beetles. Japanese beetles have a metallic-like brown and green shell. The bugs tend to grow in the range of 9/16 of an inch in length. Adult beetles attract more Japanese Beetles to the same feeding location through “aggregation pheromones”. Skeletonized leaves are the result as the beetles avoid the leaf veins. The Japanese beetle feeds on a variety of ornamental plants. The beetle is most active on warm, sunny days. Starting at the top of plants, the Japanese Beetle moves downward of the plant which eventually depletes the food source for the plant. We get asked all the time, and here are some of the common questions about the Japanese Beetle. What does the Japanese beetle look like? The dark green, metallic colorization of the bug are indicators that it’s a Japanese Beetle. These bugs, considered to be a pest species, are also recognizable due to the white tufts (with five tufts on each side and two on the back). Do Japanese Beetles damage trees? These pests, especially during the summer months, do damage trees by eating chunks of the tree leaves. The Japanese Beetle damage to tree leaves is evident seen just by looking at it.You can find evidence of Japanese Beetles by seeing the skeletonized-look of the tree leaves after the damage has been done. Sometimes the entire tree can be damaged. Why is the Japanese beetle harmful? Mostly because of the types of plants they attack, and their feeding habits, the Japanese Beetle can be destructive to living plants. The Japanese beetle will eat tree leaves, and leave behind skeletonized leaves as a mark of their presence. What trees/plants do Japanese beetles attack? These are just a few of the types of trees you might see the Japanese beetles attack. In order to properly get rid of the Japanese beetle, you have to know what you’re doing. Oftentimes, residents determine that a specialist, like a certified arborist, is the best approach to rid your property of these pests. Ultimately, you will need to decide whether it’s worth your while to try the do-it-yourself approach or call on a specialist to help you get rid of Japanese Beetles. Our company helps residents in the Greater Kansas City Area with Japanese Beetle Tree Care and Control Services. When you need an expert opinion, please feel free to contact us. With the rise of the infestation affecting our area, it’s important to understand that you options when it comes to Japanese Beetle treatment. It’s best to prevent the risk of these pests beforehand by consulting with a local arborist, though, if the Japanese Beetle has already started to attack your plants, your only option is to treat your property while you still can. At Hendrickson Tree Care, we actually have a new, extremely effective method for Japanese beetle tree treatment that helps to mitigate the damage from these pests, while promoting the health of the plants in the long-run. Just contact us when you’re ready to move forward. Minimizing the stress with cultural plant protection strategies such as pruning, removing weeds and proper irrigation practices. Physically removing the bugs (with hand-picking) from your plants in order to mitigate the risk of them attracting larger populations to your property. Spraying insecticides is also a common method to control the Japanese Beetle population, though, you must remember that multiple spray applications are required to be effective. At Hendrickson Tree Care, we can provide you with our approach to control the Japanese Beetle infestation on your property. Let us know if you have any questions, and we’ll be happy to book your project today!